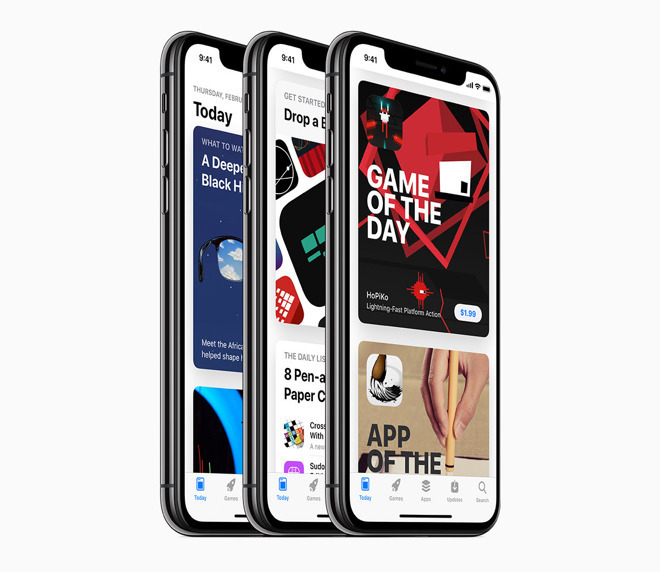 The App Store's net revenue for the March quarter was $3.7 billion, according to a Morgan Stanley investor note provided to AppleInsider. The 15-percent year-on-year increase is apparently a deceleration of 1 percent from December's growth, citing data from Sensor Tower, and when taking into account historical results, is said to be a 2 percent miss from the $3.8 billion the company could've earned. "Keeping the rest of our Apple Services forecasts unchanged, this would imply March quarter services revenue of $11.50 billion," writes the analysts, representing 17 percent year-on-year growth, but again down from the $11.6 billion forecast. Even so, it is still in line with the consensus Services revenue of $11.46 billion. The addition of new services, including the Apple TV+, Apple News+, and Apple Arcade, will contribute an estimated 1 percent to Services growth in the launch year according to the firm, based on previous launches, growing to a 3-percent contribution in the first full year after launch. Overall, the consensus believes there will be a growth deceleration of Services as a whole of 6 percent for the full-year 2019, but with a slight growth in 2020. The supposed Services growth slowdown was apparently anticipated by Morgan Stanley, the note asserts. As the rest of Wall Street forecasts a 3-point deceleration in quarterly revenue, the analysts suggest "we don't believe the market should interpret this data point as a surprise." China is a major contributor to gaming growth for the App Store, helping overall gaming revenue accelerate for the second consecutive quarter, by 9 percent year-on-year in December and 10 percent in the March quarter. Representing a third of total App Store gaming revenue, Chinese growth inflected up 2 percent year-on-year from a 1 percent decline in the December quarter. The decision by Chinese authorities to stop approving gaming licenses in March 2018 means increased growth is on the cards for the rest of the year, as while close to zero new licenses were approved between March and December 2018, there is no such stoppage in 2019. The recent approval of the first batch of 30 imported gaming licenses, with Fortnite, Call of Duty Mobile, and PUBG on the docket for approvals in the near future, is also a good sign for Chinese gaming growth. Downloads growth has stopped in the latest quarter, the data reveals, marking the first time since 2015 that there was a decline in total downloads, by 5 percent year-on-year. Despite the decline, net revenue is up 21 percent year-on-year, offsetting the downturn. The entertainment section, excluding music, is the second-largest App Store category behind gaming, and has been a source of "emerging growth" over the last four years. It was noted the December quarter saw a year-on-year growth deceleration to 39 percent from 76 percent in the prior quarter, and down to 26 percent in the March quarter. It is thought the deceleration could be due to some major companies choosing not to support Apple's payment platform to gain new subscribers. Netflix is cited as one such app, as it was the top-grossing app in 2018, but its impact is now considerably less than a year ago. The impact on entertainment revenue is still deemed to be "relatively small, and of little concern to shareholders.